Human Immunodeficiency Virus (HIV) and Tuberculosis (TB) are the double burden diseases of the world. The African continent takes a great share of TB-HIV cases worldwide. This study was aimed to determine the prevalence of TB-HIV co-infection in Ethiopia, using a meta-analysis based on a systematic review of published articles. An electronic search was conducted in databases including PubMed, HINARI, EMBASE, Cochrane library and Google Scholar to extract the articles. Articles published between 1995 and November 2017 had been searched for using different keywords. The analysis was performed using MetaXL software and R statistical software (version 3.2.3). Our searches returned a total of (n = 26,746) records from 30 articles of which 21 were cross-sectional, 7 were retrospectives and 2 were prospective studies. The range of prevalence of TB-HIV co-infection was found to be from 6 to 52.1% with random effects pooled prevalence of 22% (95% CI 19–24%) and with substantial heterogeneity chi-square (X2) = 746.0, p < 0.001, (I2 = 95.84%). Our analysis indicated that the prevalence of TB-HIV co-infection is high in Ethiopia with substantial regional variation. An integrated, facility-based and community-based effort towards the prevention, early detection and management of cases should be further strengthened throughout the country to mitigate the double burden disease. Human Immunodeficiency Virus (HIV) remained as the leading cause of mortality and morbidity; in 2016 for instance, 1.8 million people were newly infected and 1 million AIDS-related deaths were registered . HIV/AIDS and TB (Tuberculosis) are considered as the double burden diseases of the world. According to the World health organization (WHO) report, there were 1.5 million deaths attributed to TB out of which 26% were due to HIV-associated TB . In developing countries, particularly in sub-Saharan Africa, TB is increasing due to the burden of HIV . Hence, the African continent takes the greater share (74%) of the 1.2 million TB-HIV cases worldwide . In Ethiopia, 4 in 100 people die due to TB-HIV co-infection and the incidence of Multidrug-resistant Tuberculosis (MDR-TB) was estimated to be 5.8 per 1000 people . The burden of TB is still alarming due to the emergences of drug-resistant strains. Recent studies indicated that the prevalence of MDR-TB in Ethiopia is particularly noticeable (15%) in previously treated TB cases . Among laboratory-confirmed TB cases in the Oromo region, for instance, 33% of the cases were found to be MDR-TB, majorly among the adult population . This increase in MDR-TB, especially among people living with HIV is a great burden to the healthcare system; challenging the management efforts of the disease through drug interaction and immune reaction [7–9]. The associated morbidity and mortality related to noticeable economic loss of the productive society and the socioeconomic status of the country at large. In developing countries, it is estimated that around 30% of the annual household income is taken by TB and HIV associated disease . In general, people living with HIV are 20 times riskier to be infected with TB as compared to HIV negative people , with case fatality rate of 16–35%, which is almost 4 times higher than HIV free individuals . The incidence of co-infection is determined by many factors including smoking, family size, the clinical stage of HIV, use of antiretroviral therapy (ART), injectable drug use and anemia [13–15]. In addition, it is evident that HIV positivity, alcohol intake, farming occupation and previous TB contact are contributing factors for MDR-TB .TB and HIV co-infection has various health outcomes limiting the life expectancy of the infected host; accelerated by malnutrition, rapid progression of the disease, atypical TB presentations, delayed diagnosis and a low treatment response . Active tuberculosis facilitates the transcription of HIV genes resulting in increased diversity and replication of HIV . On the other hand, as the clinical stage of HIV progresses, there is an increased dissemination and extra-pulmonary TB manifestations . Finally, patients suffer due to frequent pyrexia, diarrhea, severe weight loss and wasting [19, 20]. In high burden and resource-limited countries like Ethiopia, integrating health services on TB and HIV has paramount importance in order to increase the effectiveness of the diagnosis and to improve the management approaches . Considering this, the WHO introduced collaborative strategies to control HIV associated TB and Ethiopia is one of the countries exercising this program as part of the health care system . The Centers for Disease Control (CDC) program in Ethiopia (opened in 2001) is providing guidance and technical support towards TB-HIV co-infection and MDR-TB services. As a result, large improvements have been achieved in HIV testing, ART provision and diagnostic potential. Studying the prevalence of TB-HIV co-infection is important for programmatic changes or further improvements on the existing programs. Therefore, this study was aimed to determine the prevalence of TB-HIV co-infection in Ethiopia, using a meta-analysis based on a systematic review of published articles. An electronic search was conducted to retrieve and recruit studies. Published articles of cross-sectional, prospective and retrospective cohort studies were included, which focused on the “Prevalence of TB-HIV co-infection in Ethiopia”. Databases PubMed, HINARI, EMBASE, Cochrane library, and Google Scholar search engine were used to extract journals. Articles published between 1995 and November 2017 had been searched for and their full-text was retrieved by two independent reviewers. The predetermined inclusion criteria for this analysis were: 1) studies conducted in Ethiopia, 2) either longitudinal/cohort or cross-sectional studies which assessed the prevalence of TB/HIV co-infection in Ethiopia and has a sample size of greater than 100 (n > 100). 3) Studies written in English. 4) Articles which were published and available online. Based on these inclusion criteria, 30 articles were selected and analyzed (Fig. 1). We developed a data collection tool to collect the findings from the published articles. The data collection tool was pretested on 5 articles and an amendment was done accordingly. After the preliminary data extraction, a careful analysis was made to record the type of the study, study setting/region, author and year of publication, number of patients/participants and the main outcomes of the study on the data collection tool. As summarized in Fig. 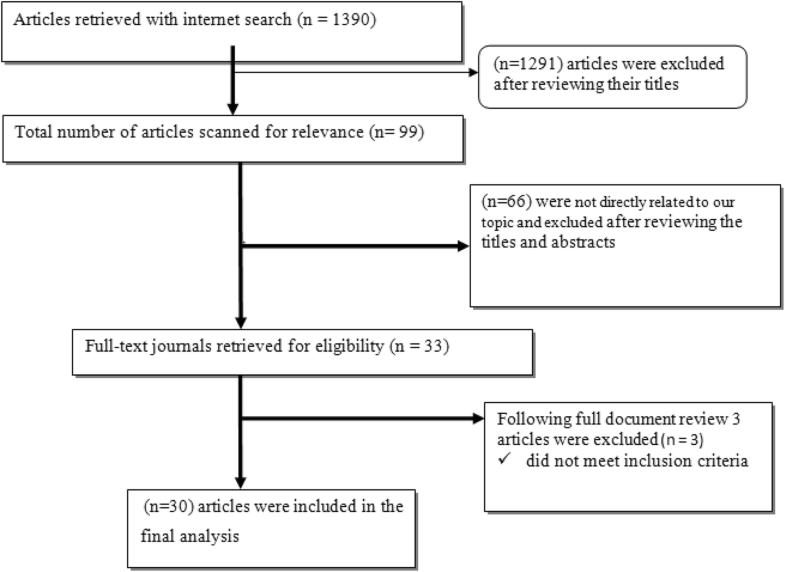 1, the literature search with the chosen search terms firstly identified 1390 citations. We repossess 99 articles after reviewing the proximity of the title to the predetermined objectives, and after further reading the abstracts of each article, only 33 of the articles were subjected to document review. 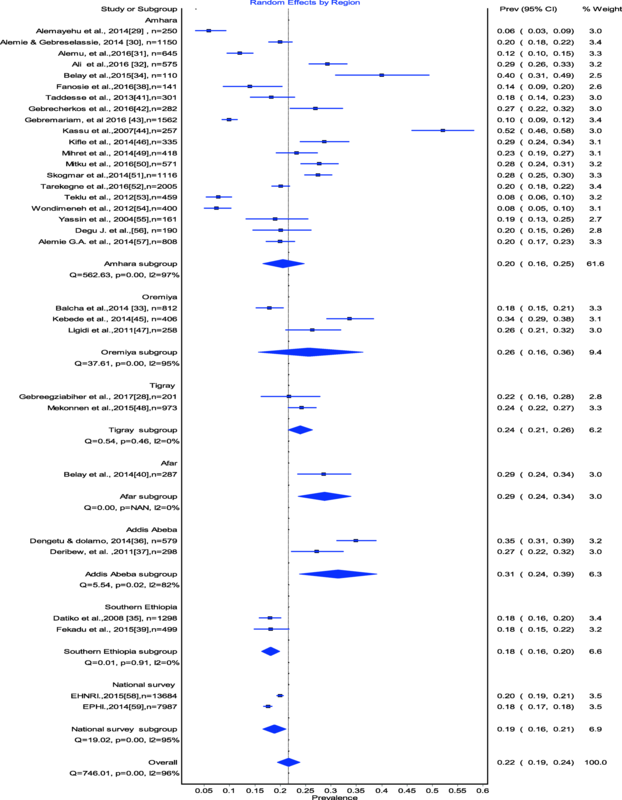 Lastly, 30 articles met the inclusion criteria for this systematic review and the meta-analysis (Fig. 1). We performed all analyses in Meta-XL software and R statistical software (version 3.2.3). When working on binary data with low prevalence, the inverse variance weight in fixed-effects meta-analyses is sub-optimum. Hence, the estimated prevalence was determined using the variance stabilizing double arcsine transformation . Wilson method was used to calculate the 95% confidence intervals; the Cochran’s Q and I2 statistic were used to determine heterogeneity [24–26]. The I2 does not essentially depend on the number of studies included. Therefore, a high, moderate and low degree of heterogeneity indicates an I2 value of 75, 50, and 25% respectively. In this study, the I2 was greater than 75% and hence the summary statistics were made using the random-effects models in which the individual study weight is the sum of the weight used in the fixed effects model and the between-study variability . To analyze the basis of heterogeneity, we performed a sensitivity analysis by excluding one largest study  and by analyzing the groups according to the geographic area. Our searches returned a total of (n = 26,746) records from 30 articles of which 21 were cross-sectional, 7 were retrospectives and 2 were prospective studies. Furthermore, 17 studies had more than 500 participants; 12 studies were conducted in the Amhara region, 6 in southern Ethiopia, 2 in Tigray, 3 in Oromia, 3 in Addis Ababa, 2 in Afar and 2 across Ethiopia. Nineteen  studies determined HIV infection among TB patients (n = 21,376) and 11 studies determined TB among HIV/AIDS patients (5370) (see Table 1). Afar and Dessie Town; in 5 health facilities. EHNRI Ethiopian Health and Nutrition Research Institite, EPHI Ethiopian Public Health Institute. Estimates of TB-HIV co-infection prevalence ranged from 6 to 52.1% (Fig. 2). The random effects pooled prevalence of TB-HIV co-infection was 22% (95% CI 179–24%) with substantial heterogeneity chi-square (X2) = 746.0, p = 0.0001, (I2 = 95.85% 95% CI: 94.9–96.6) (Fig. 2). Prevalence of TB/HIV co-infection was 20% (95% CI 16–24) in the Amhara region, 26% (95% CI 16–36) in the Oromia region, 24% (95% CI 24.21–26.0–) in the Tigray Region, 15% (95% CI 9–21) in Southern Ethiopia, 28% (95% CI 21–36) in Addis Ababa and 34% (95% CI 23–45) in the Afar region (Fig. 3). As part of our sensitivity analyses, we excluded one large study ; estimates of TB-HIV co-infection prevalence did not change. 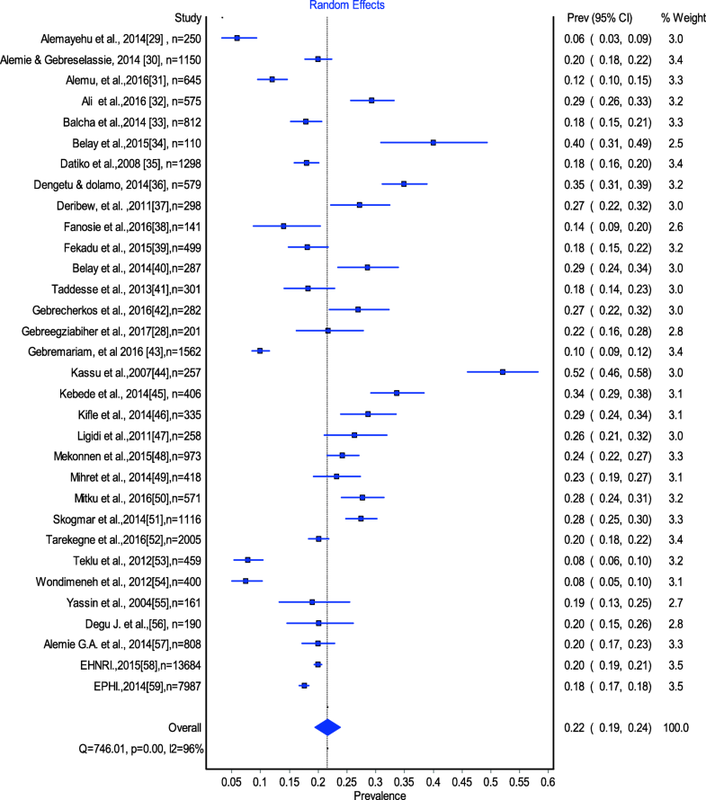 This systematic review and meta-analysis of TB-HIV co-infection identified 30 studies of 26,746 individuals in Ethiopia. Our pooled results confirmed that the prevalence of TB-HIV co- infection is 22% in Ethiopia. Furthermore, the high prevalence of HIV/AIDS in the general population is related to a higher prevalence of TB-HIV co-infection. This result is almost consistent with one global study  but higher than the finding in China (11%) , Nigeria (17.5%)  and Ghana (18.2%) . According to the subgroup analysis, the highest prevalence was found in the Addis Ababa region (31%), followed by the Afar regional state (29%), whereas the lowest prevalence was found in southern Ethiopia (18%). The substantial difference between the regions might be due to the difference in the socio-cultural and demographic characteristics of the population and associated HIV prevalence [63, 64]. Supporting this, the rank of the regions based on the prevalence of HIV evidenced in the Ethiopian Demographic Health Survey (EDHS) 2016 report , is majorly consistent with the rank of the regions in this pooled analysis. This is logically sounding because HIV is the driving factor for TB infection as a result of the immunosuppression. As Ethiopia is among the high burden countries for TB and HIV, it may be expected to find a high prevalence of TB-HIV co-infection. However, the pooled prevalence of TB-HIV co-infection (22%) is still higher than the WHO estimated figure (8%) in 2017 . The pooled prevalence of TB-HIV co-infection in the current study is bothersome considering the feared complications and emergence of drug resistance; in Ethiopia, the estimated prevalence of MDR-TB is particularly high in previously treated cases (14%) . In addition to this, HIV had been significantly associated with MDR-TB; studies indicate that there was a high rate of MDR-TB among HIV positive individuals; 14% in Addis Ababa , 19.4% in the Amhara region  and 19.5% in the Oromia region . However, only 70% of those with MDR-TB are thought to be started on second-line treatment and the coverage of ART initiation was 88% in those confirmed to have TB . Moreover, as part of the millennium development goals and now the health sector transformation plan, Ethiopia has been working to reduce HIV and TB associated morbidity and mortalities. Therefore, the pooled prevalence in the current study is still alarming despite the previous efforts. It implicates that efforts are still needed in reducing HIV associated TB which may include prevention, early detection and comprehensive management of cases. As part of the early detection of cases, TB contact household based screening may have a significant input to augment the facility-based screening of TB among HIV positive individuals . In addition to the prevention, early diagnosis helps the early initiation of ART which in turn significantly increases the success rate of TB treatment among HIV patients . TB-HIV co-infection has a great impact on the health outcome of the victims due to accelerated progression. Co-infected individuals have significantly lower years of survival as compared to those HIV positive only . Witnessing this, though the case fatality ratio of TB in Ethiopia is 0.17, the case fatality ratio of TB-HIV together is estimated to be 0.28 . The simultaneous occurrence of the two infections results in different immunological changes, such as the polyclonal activation of HIV harboring lymphocytes and an increased survival of the bacilli inside macrophages . In addition, there is a clear impact on treatment success rate; as compared to TB alone or HIV alone, co-infected patients are more vulnerable to treatment failure and there is a low rate of treatment success . Poor treatment outcome is 2 times higher among TB-HIV patients . Therefore, this TB treatment failure, poor adherence to ART, the progression of the two diseases and the presence of other co-morbidities may significantly facilitate the death of TB-HIV patients . As a limitation, this study did not explain the heterogeneity in terms of differences in the study setting, population or year. In addition, due to differences in the design and population of the studies, this study did not present the analysis of the trends of prevalence over the years. Our analysis indicated that the prevalence of TB-HIV co-infection is high in Ethiopia with substantial regional variation. Therefore, an integrated and consistent facility-based as well as community-based effort addressing the prevention, early detection and management of TB and HIV infection should be further strengthened throughout the country to mitigate the double burden disease. We would like to acknowledge Aksum University College of Health Sciences for providing the internet access. This work was not funded by any external funding agent. MT&NA: Conceived and designed the review, made the literature search, did the statistical analysis and wrote the manuscript; SW &HG: participated in statistical analysis. All authors read and approved the final manuscript.